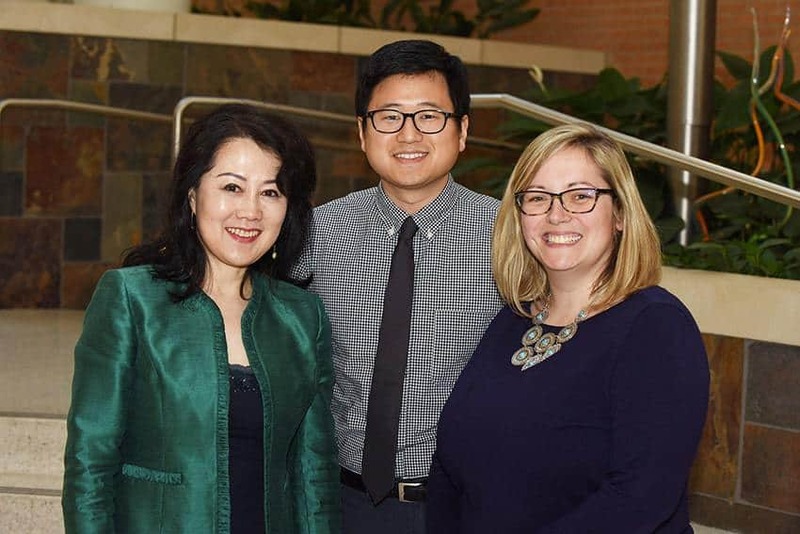 Leading the UAMS Radiation Oncology Residency Program are (from left) Fen Xia, M.D., Ph.D., Department of Radiation Oncology chair and residency program director; Thomas Kim, M.D., assistant residency program director; and Ellie Dickinson, residency coordinator. March 21, 2018 | LITTLE ROCK – Radiation oncology is a complex and competitive field, attracting some of the brightest medical students from across the country. Until now, however, anyone in Arkansas interested in pursuing a career in radiation oncology had to leave the state for advanced training. This summer, that will change when Arkansas’ first-ever radiation oncology residency program welcomes its inaugural resident at UAMS. “UAMS has recognized the need for a residency program for many years, and establishing it has been high priority since I arrived in July 2016. Many people and groups at UAMS came together to support this dream and make it a reality,” said Fen Xia, M.D., Ph.D., chair of the Department of Radiation Oncology in the UAMS College of Medicine and director of the Radiation Oncology Residency Program. The goal of the four-year program is to educate the next generation of radiation oncologists, whether they choose to treat patients, conduct research, teach or practice any combination of those. This is particularly important in a primarily rural state like Arkansas, as many radiation oncologists choose to practice in larger, more metropolitan areas. “It’s important for our patients, for UAMS and for all of Arkansas that we are active in educating and training radiation oncologists who we hope will remain in Arkansas for their careers,” said Xia. The program, which is accredited by the Accreditation Council for Graduate Medical Education (ACGME), holds four residency slots. The first resident will arrive in July 2018, followed by one additional resident each year for the following three years. In subsequent years, as one resident graduates, an additional one will be added, keeping the program’s participation at a total of four. Xia hopes to see that number increase in the future. “The UAMS Radiation Oncology Center sees about 900 patients each year. As that number grows, we have the potential to increase our residency numbers as well,” she said, adding that there are only 193 radiation oncology residency slots available in all programs across the United States. Residents for the 2018 and 2019 slots have already been selected through a highly competitive application process. Physicians interested in pursuing radiation oncology must have already completed a one-year internship, and many also have earned doctoral degrees in addition to medical degrees. “This field draws an impressive caliber of medical students, many who have already published academic papers and conducted important research,” said Thomas Kim, M.D., assistant professor in the Department of Radiation Oncology and assistant director of the residency program. Kim, who joined UAMS in 2017, was recruited not only to treat patients, but also to help advance the department’s educational standing. He and others in the department took an active role in the accreditation application and site visit, as well as in interviewing and selecting the program’s first residents. “I look forward to developing the curriculum and ensuring we meet our educational goals moving forward,” said Kim. In addition to the Department of Radiation Oncology faculty and staff, other groups and individuals at UAMS took an active role in making the residency program a reality, including Jim Clardy, M.D., associate dean, and Molly Gathright, M.D., assistant dean, of the Graduate Medical Education office and the College of Medicine administration. Xia also expressed gratitude to Peter Emanuel, M.D., director of the UAMS Winthrop P. Rockefeller Cancer Institute, for his support and encouragement throughout the rigorous application process and to Highlands Oncology Group in northwest Arkansas for its partnership in providing additional training opportunities for residents. “We received approval from the ACGME our first application attempt, with no conditions attached. This is a rare accomplishment and could not have happened without the support of the entire Department of Radiation Oncology and many others at UAMS,” said Xia.